One of the best ways to take a simple top and jeans to the level of a fashionista is by throwing on a killer pair of statement earrings. I'm particularly crazy for agates and love the earthy beauty of them when combined with gold for extra bling. Dara Ettinger's signature jewelry design style is one of natural luxe, and her Aubrey earrings (available in the color above or a dark teal) are perfect examples. Kenneth Jay Lane is a go-to designer for reasonably priced statement gems and his agate and 22 karat gold plated pair amp up the glam factor. 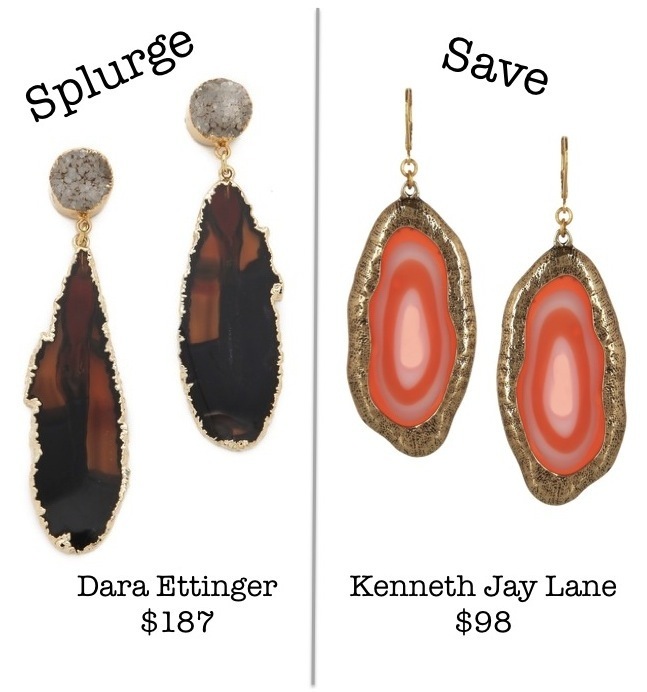 I have to say, although both agate dangles are gorgeous I think I like the Kenneth Jay Lane pair best. What about you? Both are so pretty, but I actually like the "save" version better! Great picks! I love the save version actually! I actually really like the KJL version too! I think its because of the color. Its beautiful. Definitely agree, I prefer the Kenneth Jay Lane earrings. They are such a beautiful color! I love throwing my hair up in a bun and wearing fun earrings, you're right - it's the perfect way to dress up an outfit. I'll go with the steal please.. ;D well, they are equally gorgeous, so why not, right? Those earrings are gorgeous! I like the "steal" better because the color is brighter! ♥ I really enjoyed browsing your blog. I followed you on GFC and BlogLovin' and liked your FB page! Hoping you can come by mine too :) Thank you for this post! I can't wait to read more of your posts. More power to you! Both are so pretty and awesome! But go for SAVE. They're so much more colorful. I swear I always end up loving the cheaper version too!!! Splurge, in this case, for sure!